• 1,447 sq. ft., 2 bath, 2 bdrm single story - $225,000 - Non-Rental Property! 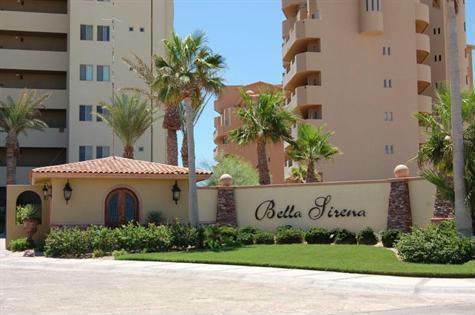 Bella Sirena, Sandy Beach - Beautiful Mediterranean-style resort condo located in property with extensive, lush vegetation. This is a limited-availability end unit with additional windows in master bathroom, allowing for more natural light. Extended patio is larger than patios of interior condos at the property and orientation allows for shade the entire summer. Spacious 2 bed 2 bath ocean view condo will please all your senses. Furnishings are all upscale and in great condition as this has not been a regular rental property. Gorgeous open-style great room floor plan with large kitchen with granite counters and rich dark wood cabinetry. Features both a breakfast bar and a separate dining area. Arched alder doors, new window coverings and deluxe tile floors throughout unit. Beautiful brick dome “boveda” ceiling in living area. Master suite has private bathroom with large spa tub, double sinks and separate shower. Large oversized patio deck is accessible from both bedrooms and the living room with amazing views of the resort pool, garden and the Sea of Cortez. All beautifully furnished and turnkey ready to move-in. This luxury 24-hour guard, gated resort on Sandy Beach will take your breath away. Call for a showing today!